I woke up one summer morning in 2005 with a numb hand. That numbness quickly spread around my body and into my legs, but it wasn’t until 2009 and after a lumbar puncture that I was finally definitively diagnosed. It actually came as something of a relief; the not knowing was far worse than actually finding out I had MS. Once I knew what I was dealing with, I could get on with my life. How does MS affect your running? As well as a general loss of sensation across my body, I’ve lost about 10-15% of the muscle on my left-hand side and a lot of flexibility in my ankle. This means I tend to drop my left side when I get tired, scuffing my foot and sometimes falling over. I can run through fatigue and pins and needles and many of the symptoms of MS, but the physical change the loss of muscle causes in my running gait causes knock-on physical problems in my foot, knee and hips. Mind you, given that I’ve been able to run the London Marathon twice (with the help of an ankle cuff), I shouldn’t grumble. Why do you support the MS Trust? Because I remember what it’s like to have these symptoms and to not know what’s going on inside your body or what the future holds. Patients and their families can sometimes be in limboland for years, spending a lot of time going through diagnostic tests with doctors who are pretty tight-lipped about what’s going on. The MS Trust offers support and information when you are at your most vulnerable and facing an uncertain future. Knowledge is power and the MS Trust help everyone to understand that they don’t have to go through this alone. You’ve recently started guiding visually impaired runners. What’s that like? It’s humbling and inspiring to be able to do something so simple to help someone else enjoy the sport that I love. Listening to a blind man tell you about the joy they get in the changing textures of light during a parkrun gives you a healthy dose of perspective on your own problems. How did you feel after completing your second marathon for the MS Trust? Elated, but also very aware of what a massive toll it takes on my body. Five months and more than 500 miles of training in the cold and dark of winter for one glorious 26.2 miles through the streets of London. It’s a long old way! I’m having a year off marathons in 2017! What do you get from running with your wife Caitlin? 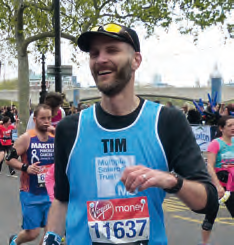 We trained and ran the 2015 Marathon side-by-side, and it was wonderful to spend all that time together and to fully share the experience, but it’s also really hard running at someone else’s pace and I crossed the finishing line that day knowing that I needed to run it again on my own. As it turns out, we both ran the 2016 race faster – Caitlin by a couple of minutes and me by 40 minutes. It seems that we’re both faster when we run apart! You and Caitlin have raised £12,800 this year. What’s your experience of fundraising been like? The generosity and good wishes of family, friends and total strangers has bowled me over again this year and it’s their kindness that powered me around London when the going got tough during the marathon. We raised over £7,200 in 2015, but it looks like we’re on track to double that this year. That money will make a massive difference to a charity very close to our hearts. It’s humbling. What would you say to someone with MS who was thinking about taking on a challenge like this? Do it. Push those limits and don’t let anyone – especially not yourself – tell you that your MS means that you can’t do something. You will never know how much you can achieve unless you try. It sounds trite, but it’s true. Maybe you won’t be able to run a marathon, but I bet there’s something else you can do that will stick two fingers up at this horrible condition. Can you tell us about your new tattoo? When I crossed the finish line this year, I knew I wanted to commemorate the achievement somehow as a permanent reminder of what I’d achieved. I’ve been inspired by a quote by the Japanese novelist and sometime marathon runner, Haruki Murakami: Pain is inevitable. Suffering is optional. That encapsulates how I try to live my life, so I had it tattooed just above my weaker left ankle in a circle around the number 26.2. You might think you can’t take another step, but whether or not you actually take that next step is up to you.